Congratulations, your Samba networking skills are developing nicely. You started out with three simple networks in “No-Frills Samba Servers”, and then in “Small Office Networking” you designed and built a network that provides a high degree of flexibility, integrity, and dependability. It was enough for the basic needs each was designed to fulfill. In this chapter you address a more complex set of needs. The solution you explore introduces you to basic features that are specific to Samba-3. You should note that a working and secure solution could be implemented using Samba-2.2.x. In the exercises presented here, you are gradually using more Samba-3-specific features, so caution is advised for anyone who tries to use Samba-2.2.x with the guidance here given. To avoid confusion, this book is all about Samba-3. Let's get the exercises in this chapter underway. You have made Mr. Meany a very happy man. Recently he paid you a fat bonus for work well done. It is one year since the last network upgrade. You have been quite busy. Two months ago Mr. Meany gave approval to hire Christine Roberson, who has taken over general network management. Soon she will provide primary user support. You have demonstrated that you can delegate responsibility and can plan and execute according to that plan. Above all, you have shown Mr. Meany that you are a responsible person. Today is a big day. Mr. Meany called you to his office at 9 a.m. for news you never expected: You are going to take charge of business operations. Mr. Meany is retiring and has entrusted the business to your capable hands. Mr. Meany may be retiring from this company, but not from work. He is taking the opportunity to develop Abmas Accounting into a larger and more substantial company. He says that it took him many years to learn that there is no future in just running a business. He now realizes there is great personal satisfaction in the creation of career opportunities for people in the local community. He wants to do more for others, as he is doing for you. Today he spent a lot of time talking about his grand plan for growth, which you will deal with in the chapters ahead. Over the past year, the growth projections were exceeded. The network has grown to meet the needs of 130 users. Along with growth, the demand for improved services and better functionality has also developed. You are about to make an interim improvement and then hand over all Help desk and network maintenance to Christine. Christine has professional certifications in Microsoft Windows as well as in Linux; she is a hard worker and quite likable. Christine does not want to manage the department (although she manages well). She gains job satisfaction when left to sort things out. Occasionally she wants to work with you on a challenging problem. When you told her about your move, she almost resigned, although she was reassured that a new manager would be hired to run Information Technology, and she would be responsible only for operations. You promised the staff Internet services including Web browsing, electronic mail, virus protection, and a company Web site. Christine is eager to help turn the vision into reality. Let's see how close you can get to the promises made. The network you are about to deliver will service 130 users today. Within a year, Abmas will aquire another company. Mr. Meany claims that within 2 years there will be well over 500 users on the network. You have bought into the big picture, so prepare for growth. You have purchased a new server and will implement a new network infrastructure. You have decided to not recycle old network components. The only items that will be carried forward are notebook computers. You offered staff new notebooks, but not one person wanted the disruption for what was perceived as a marginal update. You decided to give everyone, even the notebook user, a new desktop computer. You procured a DSL Internet connection that provides 1.5 Mb/sec (bidirectional) and a 10 Mb/sec ethernet port. You registered the domain abmas.us, and the Internet Service Provider (ISP) is supplying secondary DNS. Information furnished by your ISP is shown in “Abmas.US ISP Information”. It is of paramount priority that under no circumstances will Samba offer service access from an Internet connection. You are paying an ISP to give, as part of its value-added services, full firewall protection for your connection to the outside world. The only services allowed in from the Internet side are the following destination ports: http/https (ports 80 and 443), email (port 25), DNS (port 53). All Internet traffic will be allowed out after network address translation (NAT). No internal IP addresses are permitted through the NAT filter because complete privacy of internal network operations must be assured. Christine recommended that desktop systems should be installed from a single cloned master system that has a minimum of locally installed software and loads all software off a central application server. The benefit of having the central application server is that it allows single-point maintenance of all business applications, a more efficient way to manage software. She further recommended installation of antivirus software on workstations as well as on the Samba server. Christine knows the dangers of potential virus infection and insists on a comprehensive approach to detective as well as corrective action to protect network operations. A significant concern is the problem of managing company growth. Recently, a number of users had to share a PC while waiting for new machines to arrive. This presented some problems with desktop computers and software installation into the new users' desktop profiles. Many of the conclusions you draw here are obvious. Some requirements are not very clear or may simply be your means of drawing the most out of Samba-3. Much can be done more simply than you will demonstrate here, but keep in mind that the network must scale to at least 500 users. This means that some functionality will be overdesigned for the current 130-user environment. In this exercise we use a 24-bit subnet mask for the two local networks. This, of course, limits our network to a maximum of 253 usable IP addresses. The network address range chosen is one assigned by RFC1918 for private networks. When the number of users on the network begins to approach the limit of usable addresses, it is a good idea to switch to a network address specified in RFC1918 in the 172.16.0.0/16 range. This is done in subsequent chapters. The high growth rates projected are a good reason to use the tdbsam passdb backend. The use of smbpasswd for the backend may result in performance problems. The tdbsam passdb backend offers features that are not available with the older, flat ASCII-based smbpasswd database. The proposed network design uses a single server to act as an Internet services host for electronic mail, Web serving, remote administrative access via SSH, Samba-based file and print services. This design is often chosen by sites that feel they cannot afford or justify the cost or overhead of having separate servers. It must be realized that if security of this type of server should ever be violated (compromised), the whole network and all data is at risk. Many sites continue to choose this type of solution; therefore, this chapter provides detailed coverage of key implementation aspects. Samba will be configured to specifically not operate on the Ethernet interface that is directly connected to the Internet. You know that your ISP is providing full firewall services, but you cannot rely on that. Always assume that human error will occur, so be prepared by using Linux firewall facilities based on iptables to effect NAT. Block all incoming traffic except to permitted well-known ports. You must also allow incoming packets to establish outgoing connections. You will permit all internal outgoing requests. The configuration of Web serving, Web proxy services, electronic mail, and the details of generic antivirus handling are beyond the scope of this book and therefore are not covered except insofar as this affects Samba-3. Notebook computers are configured to use a network login when in the office and a local account to log in while away from the office. Users store all work done in transit (away from the office) by using a local share for work files. Standard procedures dictate that on completion of the work that necessitates mobile file access, all work files are moved back to secure storage on the office server. Staff is instructed to not carry on any company notebook computer any files that are not absolutely required. This is a preventative measure to protect client information as well as private business records. All applications are served from the central server from a share called apps. Microsoft Office XP Professional and OpenOffice 1.1.0 will be installed using a network (or administrative) installation. Accounting and financial management software can also be run only from the central application server. Notebook users are provided with locally installed applications on a need-to-have basis only. The introduction of roaming profiles support means that users can move between desktop computer systems without constraint while retaining full access to their data. The desktop travels with them as they move. The DNS server implementation must now address both internal and external needs. You forward DNS lookups to your ISP-provided server as well as the abmas.us external secondary DNS server. Compared with the DHCP server configuration in “Small Office Networking”, “Abmas Accounting DHCP Server Configuration File /etc/dhcpd.conf”, the configuration used in this example has to deal with the presence of an Internet connection. The scope set for it ensures that no DHCP services will be offered on the external connection. All printers are configured as DHCP clients so that the DHCP server assigns the printer a fixed IP address by way of the Ethernet interface (MAC) address. One additional feature of this DHCP server configuration file is the inclusion of parameters to allow dynamic DNS (DDNS) operation. This is the first implementation that depends on a correctly functioning DNS server. Comprehensive steps are included to provide for a fully functioning DNS server that also is enabled for DDNS operation. This means that DHCP clients can be autoregistered with the DNS server. You are taking the opportunity to manually set the netbios name of the Samba server to a name other than what will be automatically resolved. You are doing this to ensure that the machine has the same NetBIOS name on both network segments. As in the previous network configuration, printing in this network configuration uses direct raw printing (i.e., no smart printing and no print driver autodownload to Windows clients). Printer drivers are installed on the Windows client manually. This is not a problem because Christine is to install and configure one single workstation and then clone that configuration, using Norton Ghost, to all workstations. Each machine is identical, so this should pose no problem. This server runs a considerable number of services. From similarly configured Linux installations, the approximate calculated memory requirements are as shown in “Estimation of Memory Requirements”. You should add a safety margin of at least 50% to these estimates. The minimum system memory recommended for initial startup 1 GB, but to permit the system to scale to 500 users, it makes sense to provision the machine with 4 GB memory. An initial configuration with only 1 GB memory would lead to early performance complaints as the system load builds up. Given the low cost of memory, it does not make sense to compromise in this area. Aggregate input/output loads should be considered for sizing network configuration as well as disk subsystems. For network bandwidth calculations, one would typically use an estimate of 0.1 MB/sec per user. This suggests that 100-Base-T (approx. 10 MB/sec) would deliver below acceptable capacity for the initial user load. It is therefore a good idea to begin with 1 Gb Ethernet cards for the two internal networks, each attached to a 1 Gb Ethernet switch that provides connectivity to an expandable array of 100-Base-T switched ports. Considering the choice of 1 Gb Ethernet interfaces for the two local network segments, the aggregate network I/O capacity will be 2100 Mb/sec (about 230 MB/sec), an I/O demand that would require a fast disk storage I/O capability. Peak disk throughput is limited by the disk subsystem chosen. It is desirable to provide the maximum I/O bandwidth affordable. If a low-cost solution must be chosen, 3Ware IDE RAID Controllers are a good choice. These controllers can be fitted into a 64-bit, 66 MHz PCI-X slot. They appear to the operating system as a high-speed SCSI controller that can operate at the peak of the PCI-X bandwidth (approximately 450 MB/sec). Alternative SCSI-based hardware RAID controllers should also be considered. Alternately, it makes sense to purchase well-known, branded hardware that has appropriate performance specifications. As a minimum, one should attempt to provide a disk subsystem that can deliver I/O rates of at least 100 MB/sec. Disk storage requirements may be calculated as shown in “Estimation of Disk Storage Requirements”. The preferred storage capacity should be approximately 1 Terabyte. Use of RAID level 5 with two hot spare drives would require an 8-drive by 200 GB capacity per drive array. Your industry is coming under increasing accountability pressures. Increased paranoia is necessary so you can demonstrate that you have acted with due diligence. You must not trust your Internet connection. Apart from permitting more efficient management of business applications through use of an application server, your primary reason for the decision to implement this is that it gives you greater control over software licensing. You are well aware that the current configuration results in some performance issues as the size of the desktop profile grows. Given that users use Microsoft Outlook Express, you know that the storage implications of the .PST file is something that needs to be addressed later. “Abmas Network Topology 130 Users” demonstrates the overall design of the network that you will implement. The information presented here assumes that you are already familiar with many basic steps. As this stands, the details provided already extend well beyond just the necessities of Samba configuration. This decision is deliberate to ensure that key determinants of a successful installation are not overlooked. This is the last case that documents the finite minutiae of DHCP and DNS server configuration. Beyond the information provided here, there are many other good reference books on these subjects. The NetBIOS name of the Samba server is set to DIAMOND. The Domain name is set to PROMISES. Ethernet interface eth0 is attached to the Internet connection and is externally exposed. This interface is explicitly not available for Samba to use. Samba listens on this interface for broadcast messages but does not broadcast any information on eth0, nor does it accept any connections from it. This is achieved by way of the interfaces parameter and the bind interfaces only entry. The passdb backend parameter specifies the creation and use of the tdbsam password backend. This is a binary database that has excellent scalability for a large number of user account entries. WINS serving is enabled by the wins support = Yes, and name resolution is set to use it by means of the name resolve order = wins bcast hosts entry. The Samba server is configured for use by Windows clients as a time server. Samba is configured to directly interface with CUPS via the direct internal interface that is provided by CUPS libraries. This is achieved with the printing = CUPS as well as the printcap name = CUPS entries. External interface scripts are provided to enable Samba to interface smoothly to essential operating system functions for user and group management. This is important to enable workstations to join the Domain and is also important so that you can use the Windows NT4 Domain User Manager as well as the Domain Server Manager. These tools are provided as part of the SRVTOOLS.EXE toolkit that can be downloaded from the Microsoft FTP site. The smb.conf file specifies that the Samba server will operate in (default) security = user mode (User Mode). Domain logon services as well as a Domain logon script are specified. The logon script will be used to add robustness to the overall network configuration. Roaming profiles are enabled through the specification of the parameter, logon path = \\%L\profiles\%U. The value of this parameter translates the %L to the name by which the Samba server is called by the client (for this configuration, it translates to the name DIAMOND), and the %U will translate to the name of the user within the context of the connection made to the profile share. It is the administrator's responsibility to ensure there is a directory in the root of the profile share for each user. This directory must be owned by the user also. An exception to this requirement is when a profile is created for group use. Precautionary veto is effected for particular Windows file names that have been targeted by virus-related activity. Additionally, Microsoft Office files are vetoed from opportunistic locking controls. This should help to prevent lock contention-related file access problems. Every user has a private home directory on the UNIX/Linux host. This is mapped to a network drive that is the same for all users. The following sections cover each step in logical and defined detail. The preparation in this section assumes that your SUSE Enterprise Linux Server 8.0 system has been freshly installed. It prepares basic files so that the system is ready for comprehensive operation in line with the network diagram shown in “Abmas Network Topology 130 Users”. The printer entries are not necessary if named is started prior to startup of cupsd, the CUPS daemon. To ensure that your kernel is capable of IP forwarding during configuration, you may wish to execute that command manually also. This setting permits the Linux system to act as a router. Installation of a basic firewall and NAT facility is necessary. The following script can be installed in the /usr/local/sbin directory. It is executed from the /etc/rc.d/boot.local startup script. In your case, this script is called abmas-netfw.sh. The script contents are shown in “NAT Firewall Configuration Script”. The server is now ready for Samba configuration. During the validation step, you remove the entry for the Samba server diamond from the /etc/hosts file. This is done after you are satisfied that DNS-based name resolution is functioning correctly. When you have completed this section, the Samba server is ready for testing and validation; however, testing and validation have to wait until DHCP, DNS, and printing (CUPS) services have been configured. This operation must be performed while logged in as the root user. Successful operation is clearly indicated. If this installation should fail for any reason, refer to the operating system manufacturer's documentation for guidance. Install the smb.conf file shown in “130 User Network with tdbsam [globals] Section”, “130 User Network with tdbsam Services Section Part A”, and “130 User Network with tdbsam Services Section Part B”. Concatenate (join) all three files to make a single smb.conf file. The final, fully qualified path for this file should be /etc/samba/smb.conf. The root account is the UNIX equivalent of the Windows Domain Administrator. This account is essential in the regular maintenance of your Samba server. It must never be deleted. If for any reason the account is deleted, you may not be able to recreate this account without considerable trouble. You do of course use a valid user login ID in place of username. Using the preferred tool for your UNIX system, add each user to the UNIX groups created previously as necessary. File system access control will be based on UNIX group membership. Create the directory mount point for the disk subsystem that can be mounted to provide data storage for company files. In this case the mount point is indicated in the smb.conf file is /data. Format the file system as required, and mount the formatted file system partition using appropriate system tools. Each department is responsible for creating its own directory structure within the departmental share. The directory root of the accounts share is /data/accounts. The directory root of the finsvcs share is /data/finsvcs. The /apps directory is the root of the apps share that provides the application server infrastructure. DHCP services are a basic component of the entire network client installation. DNS operation is foundational to Internet access as well as to trouble-free operation of local networking. When you have completed this section, the server should be ready for solid duty operation. Create a file called /etc/dhcpd.conf with the contents as shown in “DHCP Server Configuration File /etc/dhcpd.conf”. Create a file called /etc/named.conf that has the combined contents of the “DNS Master Configuration File /etc/named.conf Master Section”, “DNS Master Configuration File /etc/named.conf Forward Lookup Definition Section”, and “DNS Master Configuration File /etc/named.conf Reverse Lookup Definition Section” files that are concatenated (merged) in this specific order. Create the files shown in their respective directories as shown in DNS (named) Resource Files. This instructs the name resolver function (when configured correctly) to ask the DNS server that is running locally to resolve names to addresses. In the event that the local name server is not available, ask the name server provided by the ISP. The latter, of course, does not resolve purely local names to IP addresses. The basic DHCP and DNS services are now ready for validation testing. Before you can proceed, there are a few more steps along the road. First, configure the print spooling and print processing system. Then you can configure the server so that all services start automatically on reboot. You must also manually start all services prior to validation testing. Network administrators who are new to CUPS based-printing typically experience some difficulty mastering its powerful features. The steps outlined in this section are designed to navigate around the distractions of learning CUPS. Instead of implementing smart features and capabilities, our approach is to use it as a transparent print queue that performs no filtering, and only minimal handling of each print job that is submitted to it. In other words, our configuration turns CUPS into a raw-mode print queue. This means that the correct printer driver must be installed on all clients. Configure each printer to be a DHCP client, carefully following the manufacturer's guidelines. Follow the instructions in the printer manufacturer's manuals to permit printing to port 9100. Use any other port the manufacturer specifies for direct-mode raw printing, and adjust the port as necessary in the following example commands. This allows the CUPS spooler to print using raw mode protocols. Printing drivers are installed on each network client workstation. Note: If the parameter cups options = Raw is specified in the smb.conf file, the last two steps can be omitted with CUPS version 1.1.18, or later. The UNIX system print queues have been configured and are ready for validation testing. There are two essential steps to process startup configuration. First, the process must be configured so that it automatically restarts each time the server is rebooted. This step involves use of the chkconfig tool that creates the appropriate symbolic links from the master daemon control file that is located in the /etc/rc.d directory, to the /etc/rc'x'.d directories. Links are created so that when the system run level is changed, the necessary start or kill script is run. In the event that a service is not run as a daemon, but via the internetworking super daemon (inetd or xinetd), then the chkconfig tool makes the necessary entries in the /etc/xinetd.d directory and sends a hang-up (HUP) signal to the the super daemon, thus forcing it to re-read its control files. Last, each service must be started to permit system validation to proceed. Complex networking problems are most often caused by simple things that are poorly or incorrectly configured. The validation process adopted here should be followed carefully; it is the result of the experience gained from years of making and correcting the most common mistakes. Shortcuts often lead to basic errors. You should refrain from taking shortcuts, from making basic assumptions, and from not exercising due process and diligence in network validation. By thoroughly testing and validating every step in the process of network installation and configuration, you can save yourself from sleepless nights and restless days. A well debugged network is a foundation for happy network users and network administrators. Later in this book you learn how to make users happier. For now, it is enough to learn to validate. Let's get on with it. This proves that name resolution via the /etc/hosts file is working. You may now remove the entry called diamond from the /etc/hosts file. It does not hurt to leave it there, but its removal reduces the number of administrative steps for this name. The system is looking good. Let's move on. This shows that the server is running. The proof of whether or not it is working comes when you try to add the first DHCP client to the network. Clear away all errors before proceeding. The winbindd daemon is running in split mode (normal), so there are also two instances of it. The MAC address 00:03:47:CB:81:E0 matches that specified for the IP address from which the printer has responded and with the entry for it in the /etc/dhcpd.conf file. Repeat this for each printer configured. The use of an application server is a key mechanism by which desktop administration overheads can be reduced. Check the application manual for your software to identify how best to create an administrative installation. Install software fully onto a workstation, storing data files on the same workstation. Install software fully onto a workstation with central network data file storage. Install software to run off a central application server with data files stored on the local workstation. This is often called a minimum installation, or a network client installation. Install software to run off a central application server with data files stored on a central network share. This type of installation often prevents storage of work files on the local workstation. A common application deployed in this environment is an office suite. Enterprise editions of Microsoft Office XP Professional can be administratively installed by launching the installation from a command shell. The command that achieves this is setup /a. It results in a set of prompts through which various installation choices can be made. Refer to the Microsoft Office Resource SDK and Resource Kit for more information regarding this mode of installation of MS Office XP Professional. The full administrative installation of MS Office XP Professional requires approximately 650 MB of disk space. When the MS Office XP Professional product has been installed to the administrative network share, the product can be installed onto a workstation by executing the normal setup program. The installation process now provides a choice to either perform a minimum installation or a full local installation. A full local installation takes over 100 MB of disk space. A network workstation (minimum) installation requires typically 10 MB to 15 MB of local disk space. In the latter case, when the applications are used, they load over the network. Microsoft Office Service Packs can be unpacked to update an administrative share. This makes it possible to update MS Office XP Professional for all users from a single installation of the service pack and generally circumvents the need to run updates on each network Windows client. The default location for MS Office XP Professional data files can be set through registry editing or by way of configuration options inside each Office XP Professional application. OpenOffice.Org OpenOffice Version 1.1.0 can be installed locally. It can also be installed to run off a network share. The latter is a most desirable solution for office-bound network users and for administrative staff alike. It permits quick and easy updates to be rolled out to all users with a minimum of disruption and with maximum flexibility. The process for installation of administrative shared OpenOffice involves download of the distribution ZIP file, followed by extraction of the ZIP file into a temporary disk area. When fully extracted using the unzipping tool of your choosing, change into the Windows installation files directory then execute setup -net. You are prompted on screen for the target installation location. This is the administrative share point. The full administrative OpenOffice share takes approximately 150 MB of disk space. Please do not use an administrative installation of proprietary and commercially licensed software products to violate the copyright holders' property. All software is licensed, particularly software that is licensed for use free of charge. All software is the property of the copyright holder unless the author and/or copyright holder has explicitly disavowed ownership and has placed the software into the public domain. Software that is under the GNU General Public License, like proprietary software, is licensed in a way that restricts use. For example, if you modify GPL software and then distribute the binary version of your modifications, you must offer to provide the source code as well. This restriction is designed to maintain the momentum of the diffusion of technology and to protect against the withholding of innovations. Samba is provided under the terms of the GNU GPL Version 2, a copy of which is provided with the source code. Christine needs to roll out 130 new desktop systems. There is no doubt that she also needs to reinstall many of the notebook computers that will be recycled for use with the new network configuration. The smartest way to handle the challenge of the roll-out program is to build a staged system for each type of target machine, and then use an image replication tool such as Norton Ghost (enterprise edition) to replicate the staged machine to its target desktops. The same can be done with notebook computers as long as they are identical or sufficiently similar. Install MS Windows XP Professional. During installation, configure the client to use DHCP for TCP/IP protocol configuration. DHCP configures all Windows clients to use the WINS Server address that has been defined for the local subnet. Join the Windows Domain PROMISES. Use the Domain Administrator username root and the SMB password you assigned to this account. A detailed step-by-step procedure for joining a Windows 200x/XP Professional client to a Windows Domain is given in “A Collection of Useful Tidbits”, “Joining a Domain: Windows 200x/XP Professional”. Reboot the machine as prompted and then log on using the Domain Administrator account (root). Verify DIAMOND is visible in My Network Places, that it is possible to connect to it and see the shares accounts, apps, and finsvcs, and that it is possible to open each share to reveal its contents. Create a drive mapping to the apps share on the server DIAMOND. Perform an administrative installation of each application to be used. Select the options that you wish to use. Of course, you can choose to run applications over the network, correct? Now install all applications to be installed locally. Typical tools include Adobe Acrobat, NTP-based time synchronization software, drivers for specific local devices such as fingerprint scanners, and the like. Probably the most significant application for local installation is antivirus software. Now install all four printers onto the staging system. The printers you install include the accounting department HP LaserJet 6 and Minolta QMS Magicolor printers. You will also configure identical printers that are located in the financial services department. Install printers on each machine following the steps shown in the Windows client printer preparation procedure below. When you are satisfied that the staging systems are complete, use the appropriate procedure to remove the client from the domain. Reboot the system and then log on as the local administrator and clean out all temporary files stored on the system. Before shutting down, use the disk defragmentation tool so that the file system is in optimal condition before replication. Boot the workstation using the Norton (Symantec) Ghosting diskette (or CD-ROM) and image the machine to a network share on the server. You may now replicate the image to the target machines using the appropriate Norton Ghost procedure. Make sure to use the procedure that ensures each machine has a unique Windows security identifier (SID). When the installation of the disk image has completed, boot the PC. Log on to the machine as the local Administrator (the only option), and join the machine to the Domain, following the procedure set out in “A Collection of Useful Tidbits”, “Joining a Domain: Windows 200x/XP Professional”. The system is now ready for the user to log on, provided you have created a network logon account for that user, of course. Instruct all users to log on to the workstation using their assigned username and password. Click Next. In the Manufacturer: panel, select HP. In the Printers: panel, select the printer called HP LaserJet 6. Click Next. In the Available ports: panel, select FILE:. Accept the default printer name by clicking Next. When asked, “Would you like to print a test page?,” click No. Click Finish. You may be prompted for the name of a file to print to. If so, close the dialog panel. Right-click HP LaserJet 6 → Properties → Details (Tab) → Add Port. 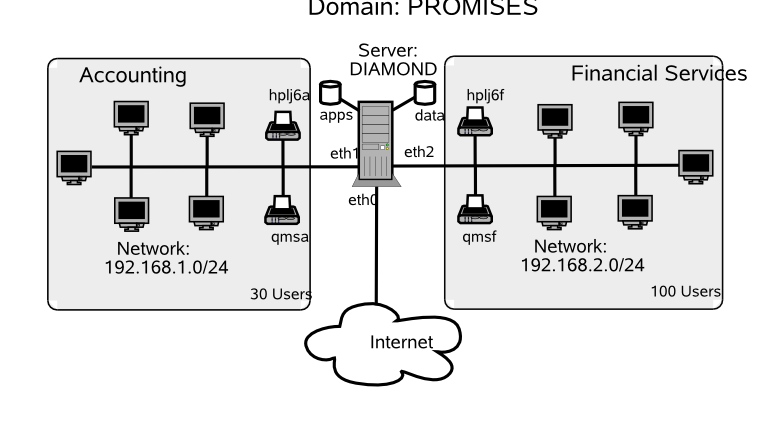 In the Network panel, enter the name of the print queue on the Samba server as follows: \\DIAMOND\hplj6a. Click OK+OK to complete the installation. Repeat the printer installation steps above for both HP LaserJet 6 printers as well as for both QMS Magicolor laser printers. How do you feel? You have built a capable network, a truly ambitious project. Future network updates can be handled by your staff. You must be a satisfied manager. Let's review the achievements. A simple firewall has been configured to protect the server in the event that the ISP firewall service should fail. The Samba configuration uses measures to ensure that only local network users can connect to SMB/CIFS services. Samba uses the new tdbsam passdb backend facility. Considerable complexity was added to Samba functionality. A DHCP server was configured to implement dynamic DNS (DDNS) updates to the DNS server. The DNS server was configured to permit DDNS only for local network clients. This server also provides primary DNS services for the company Internet presence. You introduced an application server as well as the concept of cloning a Windows client in order to effect improved standardization of desktops and to reduce the costs of network management. 1. What is the maximum number of account entries that the tdbsam passdb backend can handle? 2. Would Samba operate any better if the OS level is set to a value higher than 35? 3. Why in this example have you provided UNIX group to Windows Group mappings for only Domain Groups? 4. Why has a path been specified in the IPC$ share? 5. Why does the smb.conf file in this exercise include an entry for smb ports? 6. What is the difference between a print queue and a printer? 7. Can all MS Windows application software be installed onto an application server share? 8. Why use dynamic DNS (DDNS)? 9. Why would you use WINS as well as DNS-based name resolution? 10. What are the major benefits of using an application server? What is the maximum number of account entries that the tdbsam passdb backend can handle? The tdb data structure and support system can handle more entries than the number of accounts that are possible on most UNIX systems. A practical limit would come into play long before a performance boundary would be anticipated. That practical limit is controlled by the nature of Windows networking. There are few Windows file and print servers that can handle more than a few hundred concurrent client connections. The key limiting factors that predicate offloading of services to additional servers are memory capacity, the number of CPUs, network bandwidth, and disk I/O limitations. All of these are readily exhausted by just a few hundred concurrent active users. Such bottlenecks can best be removed by segmentation of the network (distributing network load across multiple networks). As the network grows, it becomes necessary to provide additional authentication servers (domain controllers). The tdbsam is limited to a single machine and cannot be reliably replicated. This means that practical limits on network design dictate the point at which a distributed passdb backend is required; at this time, there is no real alternative other than ldapsam (LDAP). The guideline provided in TOSHARG2, Chapter 10, Section 10.1.2, is to limit the number of accounts in the tdbsam backend to 250. This is the point at which most networks tend to want backup domain controllers (BDCs). Samba-3 does not provide a mechanism for replicating tdbsam data so it can be used by a BDC. The limitation of 250 users per tdbsam is predicated only on the need for replication, not on the limits of the tdbsam backend itself. Would Samba operate any better if the OS level is set to a value higher than 35? No. MS Windows workstations and servers do not use a value higher than 33. Setting this to a value of 35 already assures Samba of precedence over MS Windows products in browser elections. There is no gain to be had from setting this higher. Why in this example have you provided UNIX group to Windows Group mappings for only Domain Groups? At this time, Samba has the capacity to use only Domain Groups mappings. It is possible that at a later date Samba may make use of Windows Local Groups, as well as of the Active Directory special Groups. Proper operation requires Domain Groups to be mapped to valid UNIX groups. Why has a path been specified in the IPC$ share? This is done so that in the event that a software bug may permit a client connection to the IPC$ share to obtain access to the file system, it does so at a location that presents least risk. Under normal operation this type of paranoid step should not be necessary. The use of this parameter should not be necessary. Why does the smb.conf file in this exercise include an entry for smb ports? The default order by which Samba-3 attempts to communicate with MS Windows clients is via port 445 (the TCP port used by Windows clients when NetBIOS-less SMB over TCP/IP is in use). TCP port 139 is the primary port used for NetBIOS over TCP/IP. In this configuration Windows network operations are predicated around NetBIOS over TCP/IP. By specifying the use of only port 139, the intent is to reduce unsuccessful service connection attempts. The result of this is improved network performance. Where Samba-3 is installed as an Active Directory Domain member, the default behavior is highly beneficial and should not be changed. What is the difference between a print queue and a printer? A printer is a physical device that is connected either directly to the network or to a computer via a serial, parallel, or USB connection so that print jobs can be submitted to it to create a hard copy printout. Network-attached printers that use TCP/IP-based printing generally accept a single print data stream and block all secondary attempts to dispatch jobs concurrently to the same device. If many clients were to concurrently print directly via TCP/IP to the same printer, it would result in a huge amount of network traffic through continually failing connection attempts. A print server (like CUPS or LPR/LPD) accepts multiple concurrent input streams or print requests. When the data stream has been fully received, the input stream is closed, and the job is then submitted to a sequential print queue where the job is stored until the printer is ready to receive the job. Can all MS Windows application software be installed onto an application server share? Much older Windows software is not compatible with installation to and execution from an application server. Enterprise versions of Microsoft Office XP Professional can be installed to an application server. Retail consumer versions of Microsoft Office XP Professional do not permit installation to an application server share and can be installed and used only to/from a local workstation hard disk. Why use dynamic DNS (DDNS)? When DDNS records are updated directly from the DHCP server, it is possible for network clients that are not NetBIOS-enabled, and thus cannot use WINS, to locate Windows clients via DNS. Why would you use WINS as well as DNS-based name resolution? WINS is to NetBIOS names as DNS is to fully qualified domain names (FQDN). The FQDN is a name like “myhost.mydomain.tld” where tld means top-level domain. A FQDN is a longhand but easy-to-remember expression that may be up to 1024 characters in length and that represents an IP address. A NetBIOS name is always 16 characters long. The 16th character is a name type indicator. A specific name type is registered for each type of service that is provided by the Windows server or client and that may be registered where a WINS server is in use. WINS is a mechanism by which a client may locate the IP Address that corresponds to a NetBIOS name. The WINS server may be queried to obtain the IP Address for a NetBIOS name that includes a particular registered NetBIOS name type. DNS does not provide a mechanism that permits handling of the NetBIOS name type information. DNS provides a mechanism by which TCP/IP clients may locate the IP address of a particular hostname or service name that has been registered in the DNS database for a particular domain. A DNS server has limited scope of control and is said to be authoritative for the zone over which it has control. Windows 200x Active Directory requires the registration in the DNS zone for the domain it controls of service locator records that Windows clients and servers will use to locate Kerberos and LDAP services. ADS also requires the registration of special records that are called global catalog (GC) entries and site entries by which domain controllers and other essential ADS servers may be located. What are the major benefits of using an application server? The use of an application server can significantly reduce application update maintenance. By providing a centralized application share, software updates need be applied to only one location for all major applications used. This results in faster update roll-outs and significantly better application usage control. See TOSHARG2, Chapter 3. This is necessary so that Samba can act as a Domain Controller (PDC); see TOSHARG2, Chapter 4, for additional information. You may want to do the echo command last and include "0" in the init scripts, since it opens up your network for a short time. For more information regarding winbindd, see TOSHARG2, Chapter 23, Section 23.3. The single instance of smbd is normal. One additional smbd slave process is spawned for each SMB/CIFS client connection. Bench tests have shown that tdbsam is a very effective database technology. There is surprisingly little performance loss even with over 4000 users. See TOSHARG2, Chapter 9, for more information. See TOSHARG2, Chapter 9, Section 9.3.3.